Today on the show, we’ll be talking about the beef between Israel Adesanya and Jon Jones. How did this come about? Does that fight have any chance of happening in the near future? 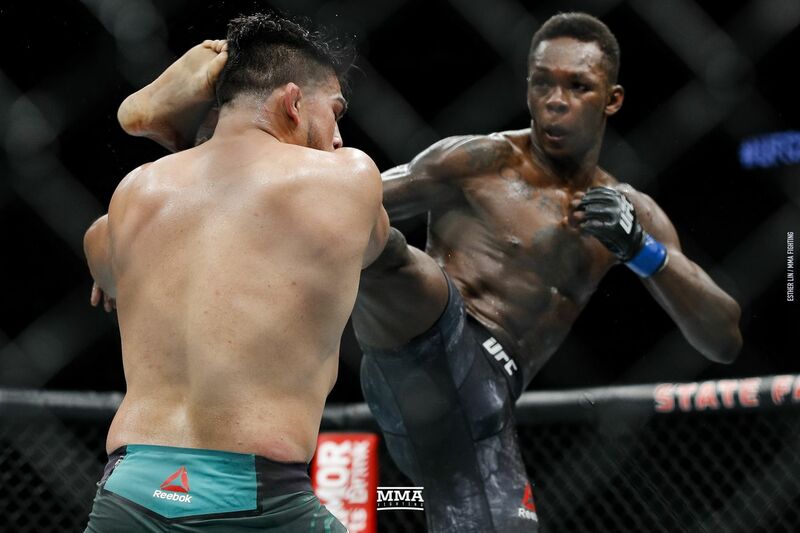 How good was Adesanya’s win over Kelvin Gastelum? We’ll also discuss the amazing Dustin Poirier vs. Max Holloway interim lightweight title fight from UFC 236. Was this the defining moment of Poirier’s career? Did the judges get the score right? What should be next for Holloway? UFC 236 had a lot of other major developments, in addition to Adesanya and Poirier continuing their ascents. Khalil Rountree picked up a very impressive win over Eryk Anders and Nikita Krylov choked out Ovince Saint Preux. The fighter pay numbers came out Monday and many felt they were lower than they should have been, so we can also discuss that. We will also speak about Khabib Nurmagomedov’s reaction to Poirier’s win. Does Nurmagomedov return as early as September? Is Poirier definitely the opponent? Is there anyway Nurmagomedov fights Conor McGregor or maybe even Tony Ferguson instead? Also on tap, Luke Rockhold is embroiled in a war of words with Anthony Smith, though both former-middleweights-turned-light-heavyweights have separate opponents forthcoming. Where did this bad blood come from? Should those two just be fighting each other? How soon before Rockhold gets that crack at Jon Jones? If there is time, we can also talk about UFC middleweight champion Robert Whittaker and what Adesanya’s win means for him, the story about at least 10 different MMA rulesets that Marc wrote earlier this week and, of course, UFC St. Petersburg coming up Saturday. That card is headlined by a heavyweight fight between Alistair Overeem and Aleksei Oleinik. Rizin also has a big card this weekend, headlined by a Muhammed Lawal facing Jiri Prochazka for the light heavyweight title. There is plenty to talk about, so join us to discuss all of the above and much more. All is up for discussion. The chat will start at our time of 1 p.m. ET/10 a.m. PT. As always, we’ll post the video window as the event draws near and answer any questions you might have if you post them in the comments below. For the comments you deem the most deserving, please click the “rec” button. Comments in green will get first priority. Please link this page and use the hashtags #theaside or #chatwrappers on Twitter when you’re watching to tell everyone you’re taking part with us. Audio-only versions of the podcast can be found on Soundcloud, iTunes, Google Play, Spotify, and Stitcher.